High quality left handed guitars can be hard to come by, but here is a lovely 2009 model Suhr Pro Series S4 SSH with a flame maple top and cherry sunburst finish. John Suhr has been building guitars since the 1980s in New York and California. He’s built guitars and amplifiers for many major artists, and for a time was Senior Master Luthier at the Fender Custom Shop. Presently, his shop is in Lake Elsinore, California. 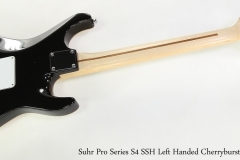 This Suhr Pro Series S4 Left Handed was a custom build and is based on a proven combination – a Maple capped Basswood body paired with a Maple neck. The Maple cap is very nicely flamed and bookmatched, and the cherry emphasises the figuring well. The body back and sides has a black finish. The neck is finished in clear gloss and has heavy nickel frets. Sperzel locking tuners are installed to the head and the bridge is a Gotoh 510, two-post trem. 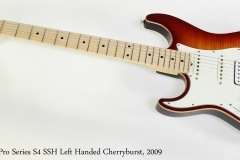 Pickups are a pair of ML Standard single coils, with a SSH Plus humbucker at the bridge. This guitar is in overall very good condition, with minimal wear; there is one small dent in the back, visible as a white dot between the neck plate and trem backplate.